This website is provided by the Brookline Substance Abuse and Violence Prevention Program — a division of the Brookline Department of Public Health, Massachusetts — which provides prevention and intervention services for Brookline youth and families. The site is for anyone concerned about teens substance use and other health risk behaviors — including parents, guardians, educators, mentors and youth workers. 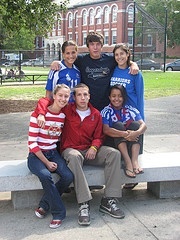 Information about the Brookline Substance Abuse Prevention Program – Providing help in Brookline for teen issues involving alcohol, drugs and other risky behaviors, and additional treatment resources. Information about the Peer Leadership Program at Brookline High School, and their activities aimed at reducing risky behaviors. Link to the Brookline Parent Education Network, which helps parents navigate social and emotional challenges affecting today’s teens. The latest research-based information on drugs and alcohol and how they affect teens, and the most recent data from the Brookline student health survey. Information on Brookline teens and their behavior from the student health surveys. Brookline Coalition Against Substance Abuse (B-CASA) hosts community events on substance abuse and other social and emotional issues impacting teens. B-CASA is partially funded by grants from the Massachusetts Department of Public Health, Bureau of Substance Abuse Services and the Brookline Community Foundation.